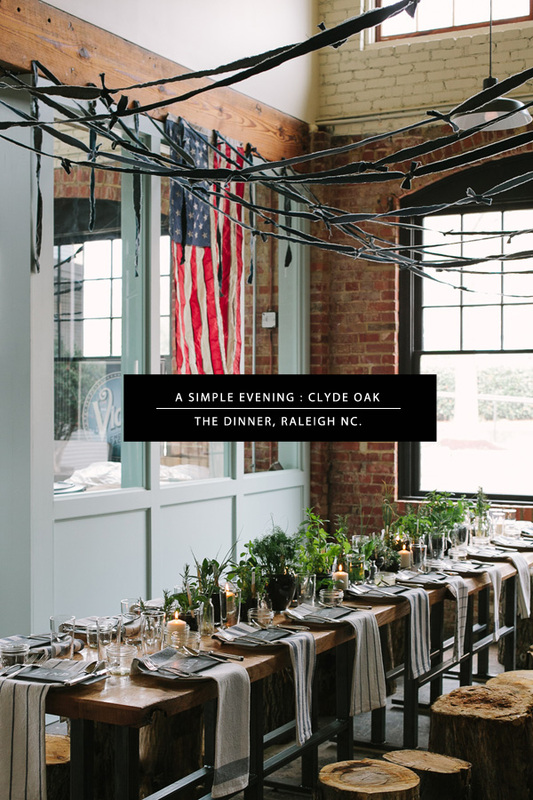 SCOUT blog : Jenn Elliott Blake | A Simple Evening : Clyde Oak The Dinner. A Simple Evening : Clyde Oak The Dinner. 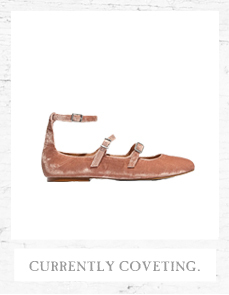 Drumroll please! …….. SO excited to be sharing the images from my recent collaboration with a wonderful team of folks down in Raleigh, NC including some close friends that always make “working” feel like nothing but play. I’ve been giving you peeks over the past few weeks of the dinner I styled a while back for Clyde Oak, including videos of all the fun over on The Fresh Exchange, but I think it’s high time to share the final images of the night – the climax of it all coming together. I’ve said it many times before, but what I loved most about this particular project was the amazing brand I had the pleasure of supporting - Clyde Oak and everything it stands for speaks volumes about what successful branding, a heartfelt vision and a wholesome perspective of the world really looks like – and the opportunity to collaborate with a group of people who strive to live out their passions everyday, and do a damn fine job doing it, made this dinner all the more exciting! 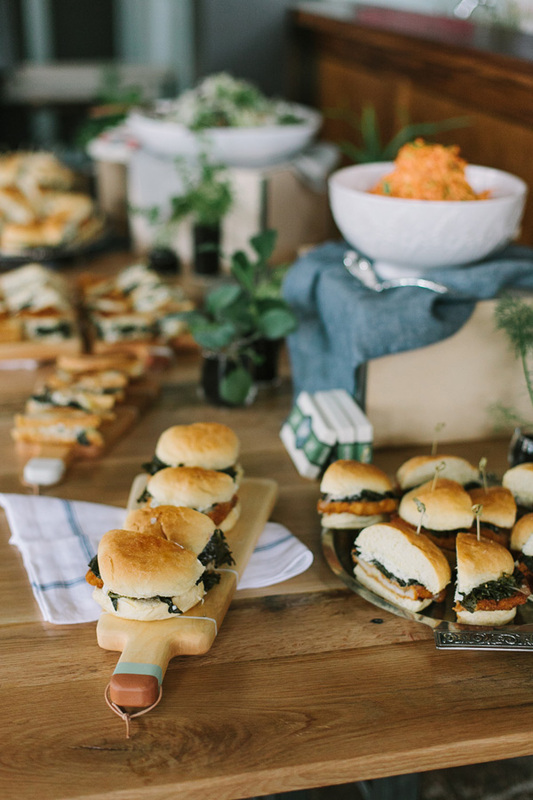 There were so many elements that came together to make this lovely dinner happen and I couldn’t have been more thrilled to style so many custom and well intended details. Dinners like this make my life as a stylist “pinch me” perfect. 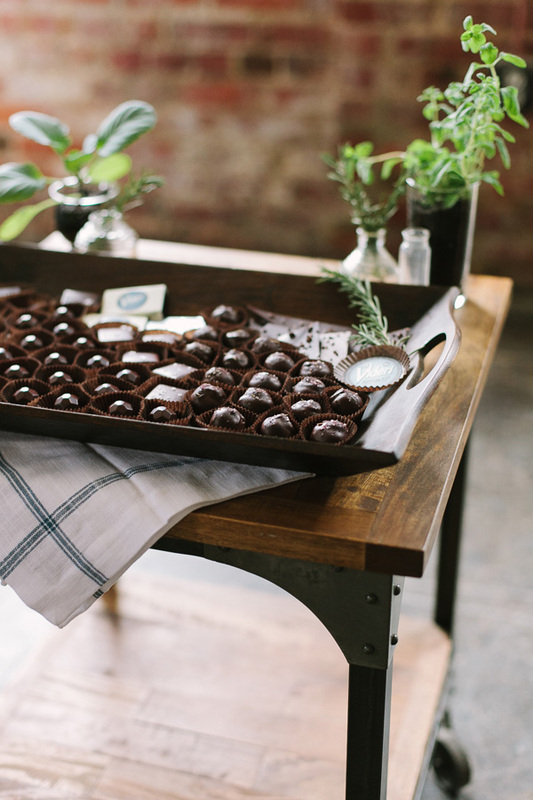 The evening itself took place at Videri Chocolate Factory (this place is Yum with a capital Y) – there is nothing better than starting a design with a very clean, gorgeous and inspiring foundation. 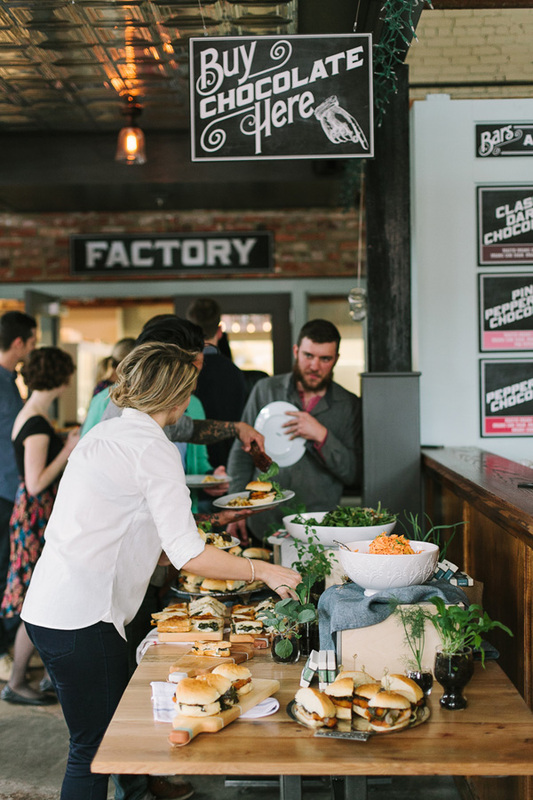 From there the dinner was built from the ground up : I tore long stripes of old pairs of denim to pay tribute to the industry of the South and the hard work of the farm, creating garland that hung high above the tabletop. Arrowhead Collective brought in custom-made tables for the occasion (yes! you heard me! custom for THIS dinner…AND I even got to see them being made! DREAM!). Corey provided a large steel plate which I used as a table runner (rust and all! 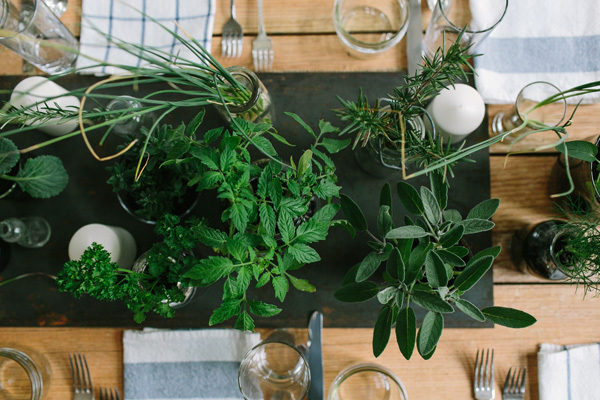 ), and then Megan and I got to layering the table with clear vintage vases filled with fresh herbs, and edible plants, even onion’s pulled straight from the earth outside. I dip painted garden sticks, which Megan handwrote each guests name on and then we placed them within the “garden” lining the table as place holders. Blue and white tea towels took the place of napkins, vintage flatware, clear glass and crisp white plates finished off each setting. Tree trunks hand cut by Corey were used as seating and perfectly complemented the rustic vibe of the night. 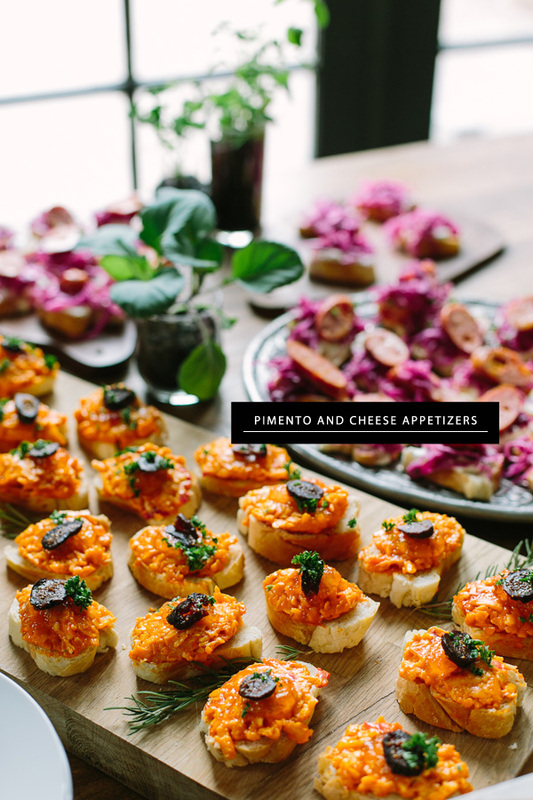 The dinner spread was probably one of my favorite things of the night to style. 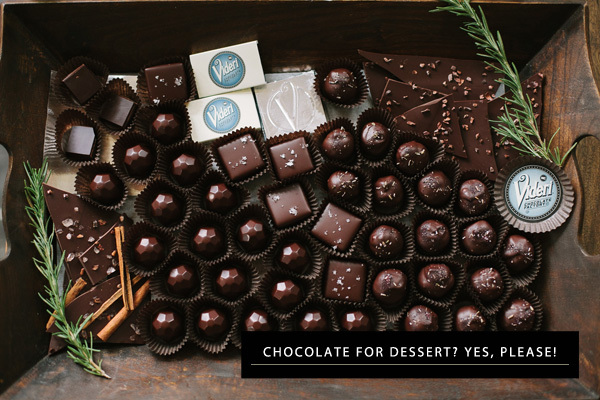 Using a plethora of soft textiles and boxes for height, I intermixed Videri’s pretty boxed chocolate branding, Milled Co. cutting boards and Capital Club 16′s tasty eats on a Arrowhead Collective table. 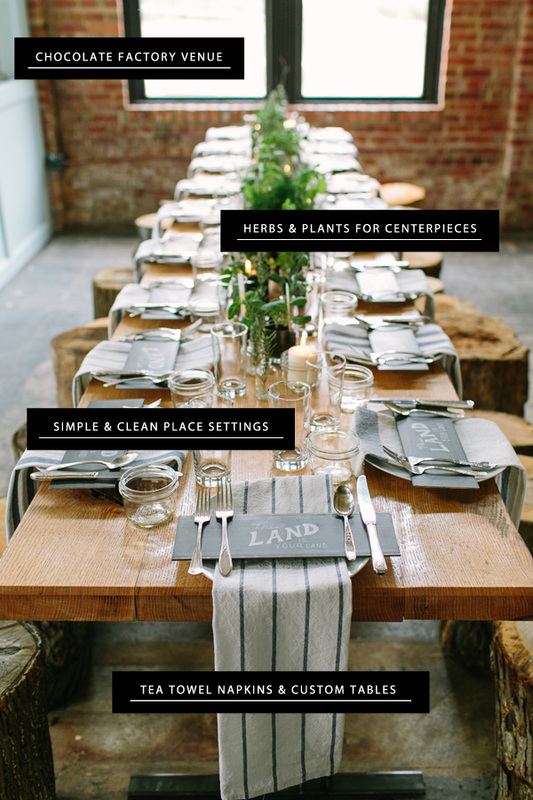 With the intention of keeping everything looking fresh, clean and crisp the table came together with ease. The greatest pleasure of the night was that everyone who had a hand in making this evening happen also shared in the meal. It was such a special moment and one that I will remember for a long time to come. 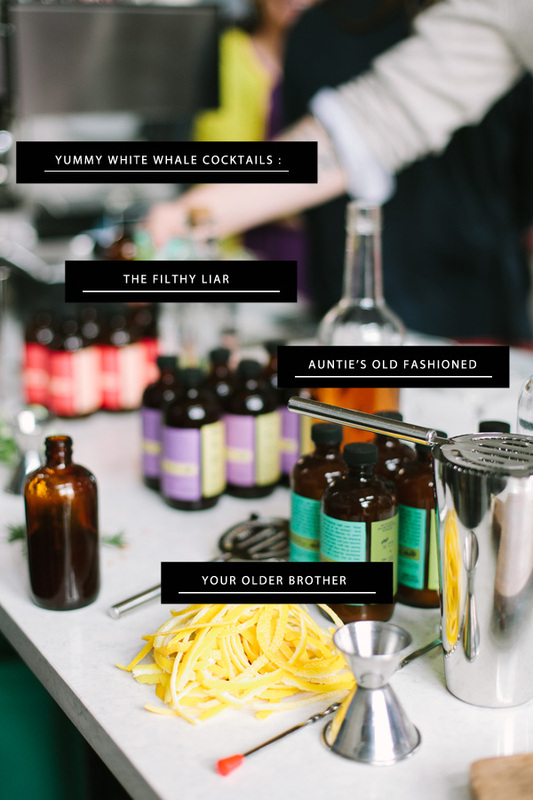 Tasty White Whale cocktails and Videri truffles were the perfect addition’s to the farm to table menu – if you haven’t had a chance to try either yet, get on that ASAP! Overall, the night became more than I could have ever imagined. It’s moments like these that make my life so complete and spending time with such an inspiring group of folks was such a thrill. A big thank you to our friend Anna Watson Carl who flew in from NYC to write up a story for Anthology Mag and my sweet friend Jonathan Grant for his help setting up the evening. So blessed to have you both there! For additional photos and a fun video of our Clyde Oak Simple Evening head over to The Fresh Exchange! photography credit : mike gilger of wild measure. 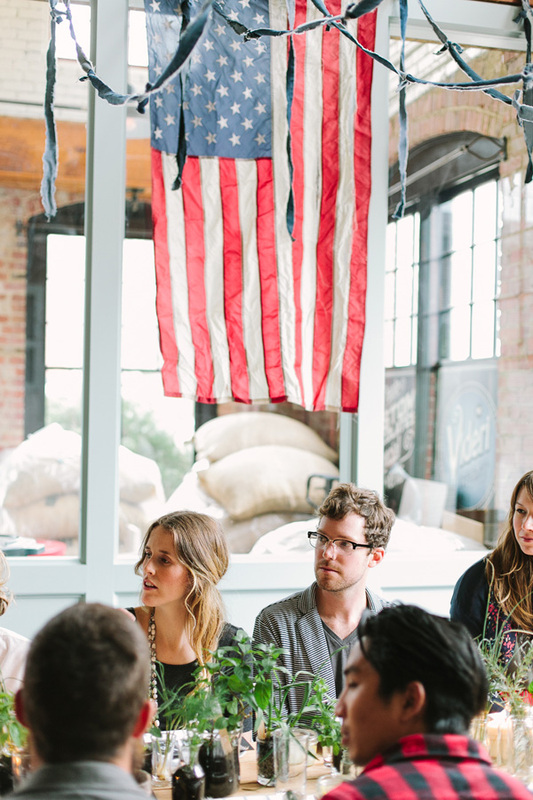 If I could dream up the perfect indoor dinner party, this would be it!! 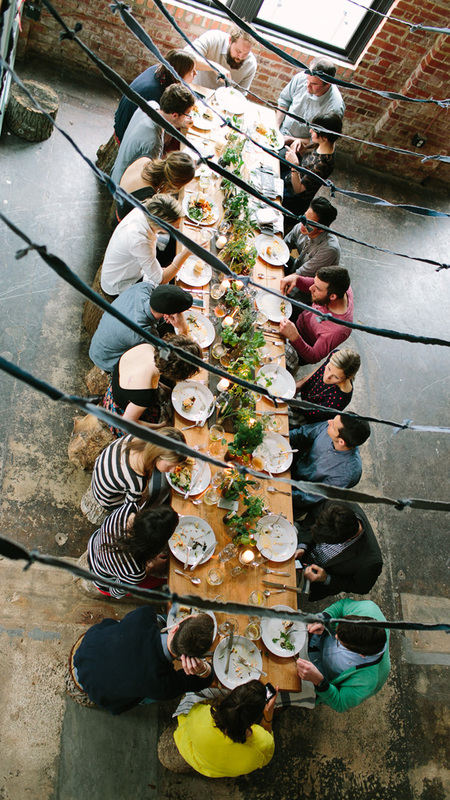 From the tree stumps to the venue and the place settings, I love it all. This whole event looks amazing! It looks like everyone had a great time! If I had been there I know I would have! The pictures are gorgeous! 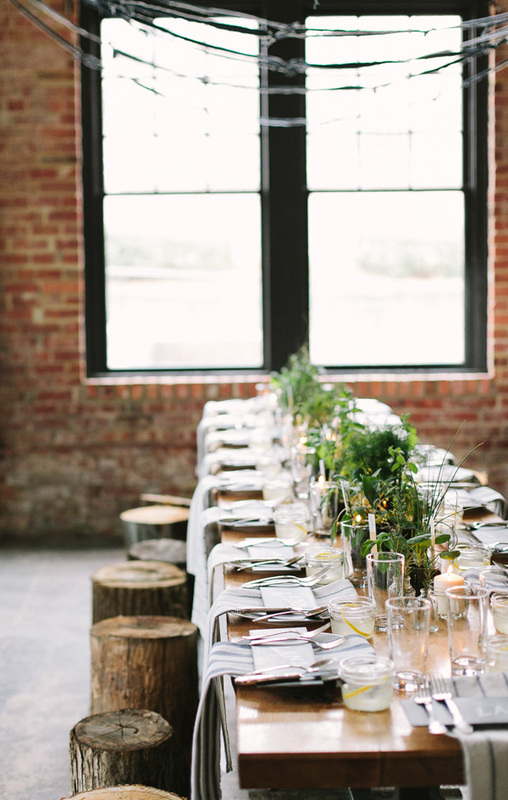 I love the herbs as center pieces and the tree stumps for the guests rumps! LOL! 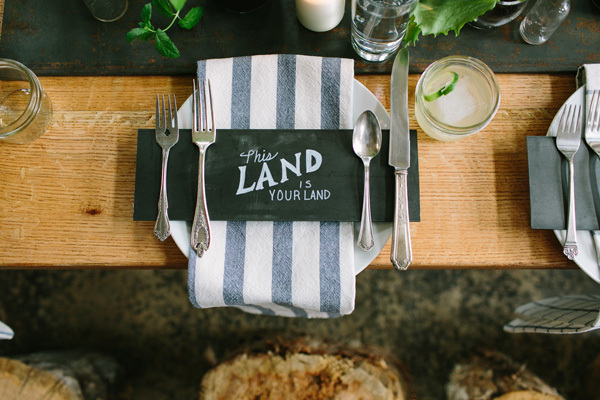 The chalkboard planks on the plates too stating “This land is your land” how awesome and appropriate for the 4th of July!